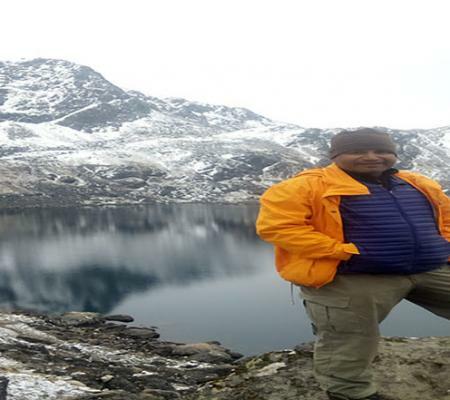 Langtang-Gosaikunda trekking is said to be one of the pleasing trips in Nepal which begin from Kathmandu which is followed by a drive to Syabrubesi. 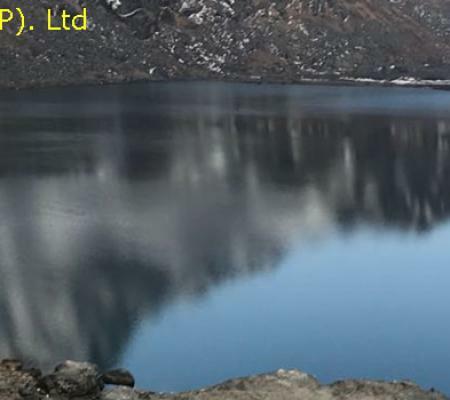 The adventure takes you to the beautiful Langtang Valley in the Langtang region of the Himalaya with high mountain lakes at Gosaikunda. 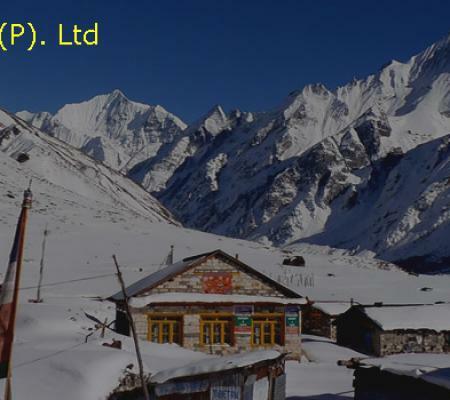 Langtang region was once affected by natural disaster including earthquake and landslides. After the region was declared safe, many tourists began to head towards the Langtang Valley. 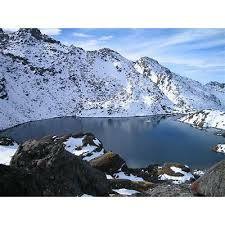 Langtang Valley Trek is also known as the valley of glaciers trek. This is the closest place where you can get beautiful views of snowcapped mountains and glaciers. The valley is surrounded by Mt. 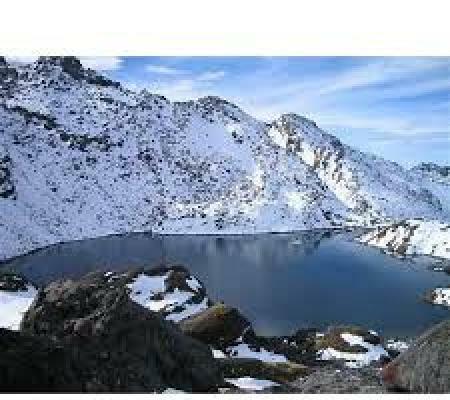 Langtang Lirung and it offers different pine forests, swift mountain streams, rugged rock and snow-capped peaks. We pass through several oak and rhododendron forests and then cross glacial moraine on the way to the Tamang village of Langtang. 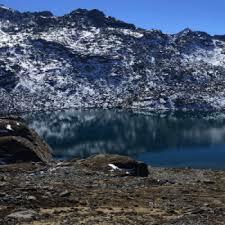 Our 16 days tours towards Langtang Valley with Gosaikunda pass trek starts from Kathmandu. We drive towards Syabrubesi with views of different beautiful mountains and settlements. We start to trek from the lower region of Langtang Valley across small villages, farmlands and verdant forest towards Kyangjing Gumba. We pass through Nubamatang which is found to be nestled in a hidden valley. We travel through Syabru to a high plateau where the sacred lake Gosaikunda is located. After crossing Llaurenebena Pass, we trek to the south towards the Helambu valley to Gul Bhanjyang. Our exciting trek ends back in Kathmandu where we started. Day 14: Kutungsang(2470m) to Chisapani(2215m) about 7 hours walking. Stunning views of great Himalayas such as; Mt. Manaslu, Annapurna, Ganesh Himal and many more. Visit UNESCO World Heritage Sites such as; Hanuman, Dhoka Square, Pashupatinath Temple, Swoyambhunath, Boudhanath Stupa and so on. As soon you arrive in Kathmandu, a representative will pick you up and transfer you to a hotel. We’ll discuss the tour later. In the evening, you’ll be served a special dinner that reflects Nepali food culture. In the morning, we leave Kathmandu and drive towards Syabrubesi which is a small beautiful village that gives the route to trek into Langtang Valley. We’ll drive through the winding road and different switchbacks. 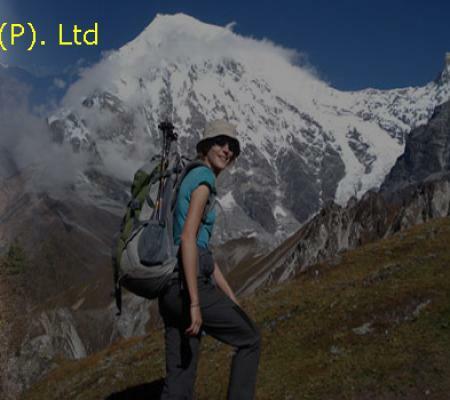 You’ll have a great opportunity to observe different beautiful mountains including Manaslu, Annapurna, and Ganesh Himal. Overnight in Syabrubesi. After an early breakfast, we continue our journey towards the Lama Hotel. We ascend and descend through different oak and rhododendron forests. Overnight in Lama Hotel. Early in the morning, after a breakfast, we trek towards Ghora Tabela through the trail of different hemlock, oaks, maples, and rhododendron forests with spectacular, fleeting glimpses of Mt. Langtang Lirung. We follow the path of Langtang Khola, climb steadily towards Langtang Valley. Overnight in Langtang Valley. Day 6 : Trek Langtang Valley (3541 m.) to Kyanjin Gumpa(3870m). After we get up early in the morning, we climb gradually towards Kyangjing Ri through the steep roads to Kyangjing Gumba. 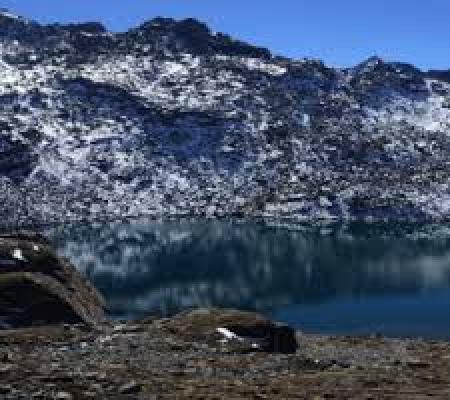 The trek offers different beautiful mountain views including Langtang Lirung, Langshisa, Gyanghempo, Ganjala Peak, Nayakang, and others. Overnight in Kyangjing Gumba. Early in the morning, we trek back to Lama Hotel along Langtang Khola through different oak and rhododendron forests. Overnight in Lama Hotel. From Lama Hotel, we descend towards Paira Lodge and then towards Thulo Syabru through the forest after crossing river. Overnight in Thulo Syabru. Next morning, the trail ascent through the forests of hemlock and oak until trail Dursagang and reach towards Singgumba. 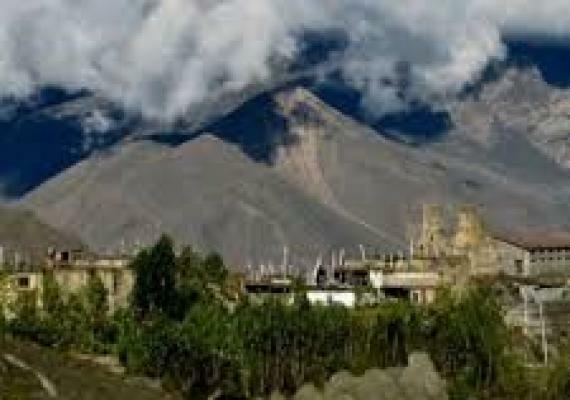 Singgumba is popular for Yak Cheese factory and the Buddhist Monastery. Overnight in Sing gumba. Early in the morning, we climb up to Lauribina Yak where you can see panoramic mountain views of Nepal and Tibet Himalayan ranges. Overnight in Lauribina Yak. ​After an early breakfast, the trek continues towards a small temple with a statue of Sakyamuni. 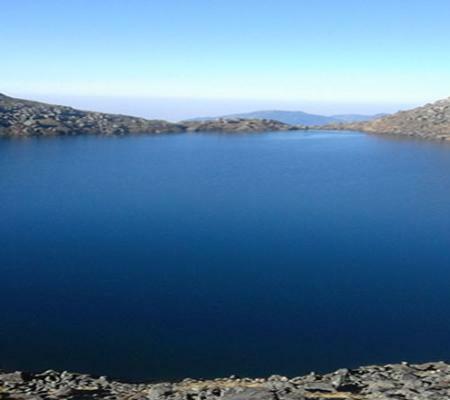 You will see awesome views of Saraswati Kunda and Bhairav Kunda on the further climb. 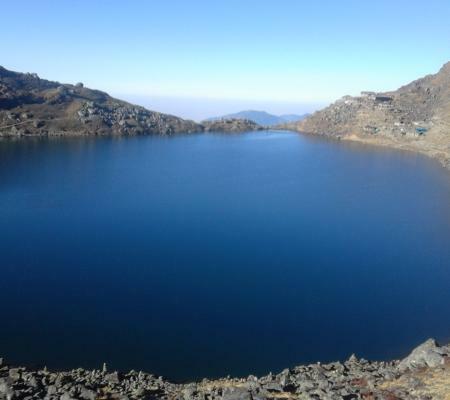 After reaching Gosaikunda, we’ll observe different beautiful small lakes in the area. Overnight in Gosaikunda. 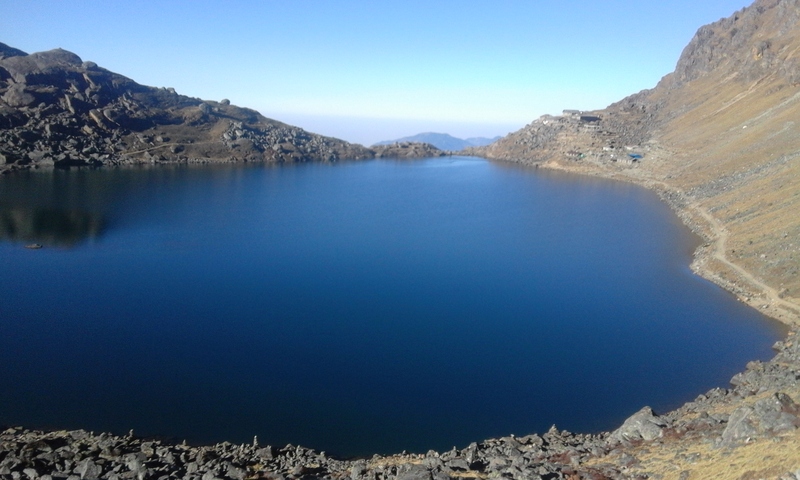 From Gosaikunda, we pass on the northern side through three more small lakes. We pass through Laurebina Pass and Phedi and finally, reach to Ghopte with following up and downhill. Overnight in Ghopte. Day 14 : Kutungsang(2470m) to Chisapani(2215m) about 7 hours walking. After an early breakfast, we descend to the delightful hill village of Gul Bhanjyang. We walk towards Thodang Betini and then down to Pati Bhanjyang. After exploring a Brahman and Chettri Village, we finally reach Chisapani. The trail goes through the oak and rhododendron forests and brings you to Borlang Bhyanjyang. We’ll see the spectacular views of different Kathmandu Valley while we trek down to Mulkhaka. Overnight in Kathmandu. Today, we travel the entire city of Kathmandu and explore different religious and cultural heritages including Pashupatinath Temple, Sowanbhunath Temple, Boudhanath Stupa and others. In the evening, we’ll enjoy the farewell party with different Nepali dishes. After an early breakfast, we’ll prepare for the final departure. A representative will help you to go back to your next destination. Transport from Kathmandu- Syabrubesi and Sundarijal - Kathmandu.